Dr. Bacheyie accepted his District 6400 COG award. Claire Sanders spoke about her work as the RAP coordinator for the Detroit River Canadian Cleanup. Youth Exchange rebounder Nathan Johnson shared his South Korean experiences. This past Monday, Past District Governor Rick Caron presented Dr. Godfrey Bacheyie with the Rotary District 6400 COG Award. The Council of Governor’s (COG) award is the “premier award of District 6400 [....] Just as the COG represents an integral working part of the Rotary logo wheel, the individual represents a vital moving part of the Rotary Wheel of Service. The COG Award is designed to recognize an individual, currently active, for outstanding service in one or more of the five avenues of service including continued service to the individual’s club”. On behalf of the Club, congratulations, Dr. Bacheyie. Thank you for your continued Service Above Self. The featured topic was the Detroit river. Club member Richard Wyma, Manager/Secretary-Treasurer of Essex Region Conservation Authority, highlighted some of the river’s “awesome facts”. Claire Sanders, Remedial Action Plan (RAP) coordinator for the Detroit River Canadian Cleanup, shared how the organization implements the Remedial Action Plan on behalf of a community-based partnership, working together to protect, restore and enhance the Detroit River ecosystem. She showcased how the river has improved environmentally, and what still needs to be done. Awesome talk by our Youth Exchange rebounder Nathan Johnson who shared his South Korean experiences with the Club. His favourite part of the trip was his hiking experiences – he hiked two times per month, and climbed 5 mountains during his exchange! He made his mark in basketball – by helping his teammates learn basketball techniques, his school won the County Championships! Prior to leaving last year, his goals were to 1) learn Korean and 2) get in shape. He not only achieved his goals, but surpassed them with flying colours. He made a lot of new friends, and the trip was definitely a positive one for him. 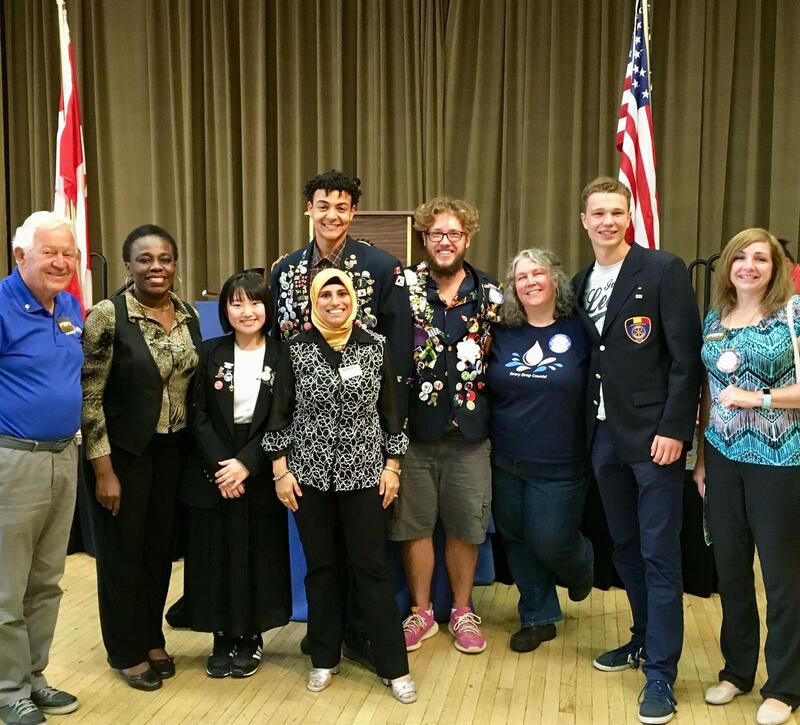 Lastly, the Club welcomed 2 new exchange students: Takako Chaen from Japan and Gaspard Jamotte from Belgium. We’re excited to get to know them! For more pictures from this meeting (courtesy of Gordon Drake), please click here.